Welcome to the live event blog from the fourth Improving Theatre Safety Clinical Community event, held on Tuesday 5th June 2018 at Royal United Bath NHS Foundation Trust. NHS Quest Trusts strive to have the safest operating theatres in the country and are undertaking a project to develop exceptional safety awareness and healthy departmental cultures in this often high-pressure environment. Members are utilising their strengths as a national network to learn from each other’s work and share new innovative approaches in their mission to ensure patients receive the safest possible surgery, every time. Using the clinical communities model, member trusts combined their expertise in June 2017 to launch the next stage of this ambitious improvement journey. At the second meeting, a packed discussion agenda was built around the theoretical framework of Deming’s Lens of Profound Knowledge and Rogers Diffusion of Innovation. Watch interviews with members in a short film, capturing the journey so far. 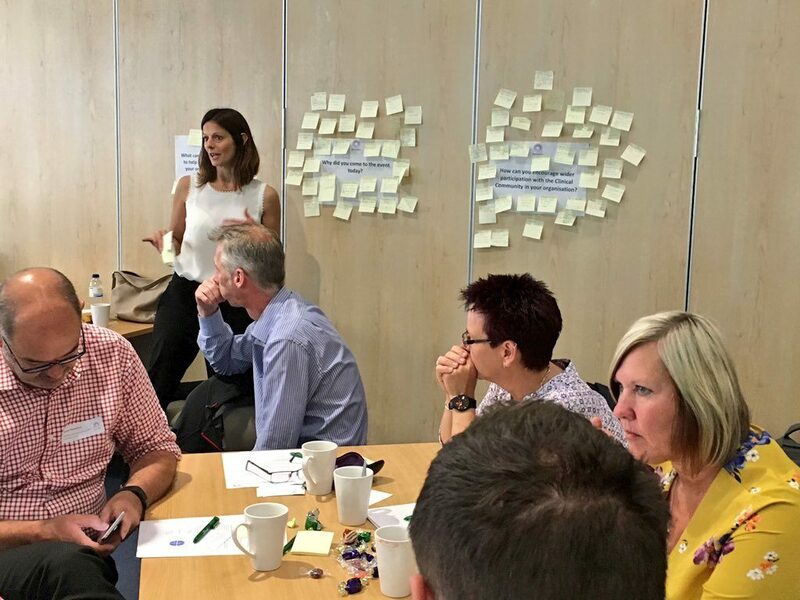 The third event was held in February 2018 and is captured in this event blog from Zoe Egerickx, NHS Quest Senior Improvement Advisor. Attendees today represent seven member Trusts from Bradford Teaching Hospitals, Calderdale & Huddersfield, Homerton University Hospitals, Royal United Hospitals Bath, Sheffield Teaching Hospitals, Western Sussex & Wrightington, Wigan & Leigh. We have a packed agenda today, featuring patient safety, human factors and behavioural insights, all tied to the primary theme of debriefing. The topic of debrief first came about following one of the clinical community webex’s held in between each event. Opening the event, NHS Quest Project Manager, Sarah Snape welcomes familiar and new faces to the community and begins with our Clinical Community Evaluation, where attendees can update on their progress and interaction with the community so far. The data collected allows us to evaluate the programme, assess if we’ve achieved our objectives and support the network as we move forward as a community. Why did you come to the event? What can you do to get people in your organisation more involved with the clinical community? What can the NHS Quest PMO do to enable people in your organisation to attend webex’s and events? Zoe collates feedback and shares the key points and common themes from the questions. Our first guest speaker of the day, Dr Suzette Woodward, National Campaign Director at Sign Up to Safety leads a session on Rethinking Patient Safety with ‘Surgical Safety Checklist: A Story‘. Suzette begins by recalling a momentous occasion when she attended a WHO meeting that marked the very start of the surgical checklist led by Dr Atul Gawande. Suzette walks the community through the evolution and implementation of the checklist. Next we look at Safety I and Safety II and the two different interpretations of safety. Safety I focuses on the absence of safety and incident reporting – a traditional view defined by the absence of accidents and incidents. Safety II explains the value of studying why things go well and replicating this. The future is not a replacement of Safety-I by Safety-II, but rather in a combination of the two ways of thinking. Suzette than explores the ‘kindness vs incivility’ concept, referring to the work of Dr Chris Turner and Civility Saves Lives, which aims to raise awareness of the power of civility in medicine. Almost all excellence in healthcare is dependent on teams, and teams work best when all members feel safe and have a voice. Civility between team members creates that sense of safety and is a key ingredient of great teams. Incivility robs teams of their potential. Are you really listening or are you just waiting for your time to talk? As we move to debriefs, Suzette refers to the time she was a ‘Games Maker’ for the London Olympics. The reason she shares this story, being one in a team of thousands of volunteers, is because of the excellent briefings encountered each morning; clear, sharp with a feeling of being safe and secure. Followed by the debrief at the end of each day with questions like “what would you like to do to make it better tomorrow”. This provoke a discussion within the community regarding the issues they encounter with safety, the constant changing environment, sharing “I don’t think I have a single day at work where I don’t cut corners – how do we make the environment better to reduce risk?” Suzette exclaims how this is such a valuable and rich discussion to be had in a debrief – one that has purpose to truly understand workarounds in a truthful and safe setting. Jane (our second guest speaker today) adds by referring back to civility – we need to remember we’re human beings and to care for each other. Following a short break our clinical lead for the programme, Dr Lesley Jordan, Obstetric Consultant Anaesthetist at Royal United Bath NHS Foundation Trust with a corporate role as the patient safety lead who has been involved in making change with quality improvement over the past nine years for a number of projects across the trust, presents their journey. In 2011/12 three incidents were recorded at the Trust – these were presented to all staff along with examples where the checklist was used well to engage and motivate staff. Now as they look ahead to debrief, Lesley highlights the use of stories to help demonstrate it’s value. However with debrief, there are new challenges such as: frequent changes to lists, low morale, organisational pressures, changes to the team and theatre location and lists running late. In the planning stages, they identified champions and collected data on how many lists ran on time and then using PDSA methodology the team carried out small tests of change, recording the learning and actions. Lesley explains how their learning has centred around the need to make it a priority for staff and to make it an efficient process so to ultimately overcome the ‘what’s in it for me?‘ barrier. To change culture, the teams next steps are to continue work on the measures, collect positive stores, empower staff to action improvement and gain senior engagement. Commenting on a thought provoking session, the community raise the idea that we all think all our lists overrun yet data Lesley presented today states 70% are actually running on time – highlighting again that our perception doesn’t necessarily match reality. We now move to the first of the Catalyst Sessions with Suzette Woodward to understand the value of storytelling. The story teller shares what happens in the their organisation for seven minutes, the listener ask clarifying and probing questions for five minutes whilst the time keeper takes notes and keeps the group to time. The teams are told we will feedback, once all participants have taken a turn in each role, after lunch. What adjustments do people make to ensure things work? What interpretations are made in order to succeed? How could we replicate good practice? Suzette is back to the front opening the afternoon and asks the room for their thoughts and learning on the trio methodology, if they struggled to tell their story or to listen? The room share their experiences of finding their role in the scenario, having to stop themselves from to interrupting and that some found the eye contact uncomfortable. Despite this, the groups felt that they found out more than they would have done if they had jumped in with their answer or solution and that it allowed time for the story teller to open up or delve deeper. The exercise encourages the community to think differently about conversation etiquette and the value of listening and telling stories. Maggie Metcalfe, Head Nurse for Surgery and Anaesthetics from Calderdale and Huddersfield, shares an example from her Trust of optimised theatre lists, which ran efficiently and positively, and resulted in a joint team debrief at the end of the list. Pnt Laloe, Consultant Anaesthetist sparks a conversation about names written on theatre cap hats and the #TheatreHatChallenge. Jane Carthey reflects that the ideas are inspiring but to remember that standardising procedures won’t work for everyone, there isn’t a ‘one size fits all’. Events such as this support the community to discover ideas that will work for them. We are now delighted to welcome our second guest speaker for the day, Dr Jane Carthey, Human Factors and Patient Safety Consultant, presenting Human Factors Insights on the Debrief. There are some things to learn from aviation; that team norms mean the debrief is ‘the way we do things around here’. Have you ever left your original copy on the photocopier? If your primary goal is completed before the end of the task, you naturally drift off. If you’ve been photocopying, your copies are complete and you walk away, then you have found yourself back at the printer 10 minutes later to pick up your original copy… this is due to the last task being after the primary goal was complete and you’ve drifted off. On the Surgical Checklist, the last task goal is debrief but before we get there the primary goal is already completed – it’s human nature that we will drift, so try not to be judgemental or hard on yourself. Jane urges the room to consider behaviour is contagious. If you are tired and want to go home and leave the debrief, that attitude permeates. In addition, one of the key things is to get the language right, begin positive. Even if it was a bad day, Jane suggests starting with ‘it’s been a long day but we got through it together as a team, thank you’ and move next to ask what went well. Jane emphasises the importance of language, the need to be neutral and constructive. Also don’t assume people know how to lead a debrief. We can be quick to make assumptions but people may not have the skills and education to lead and structure a debrief. In her final tip, remember that one size does not fit all. Jane shares an example from a theatre team who are a whiteboard and a running debrief technique. Throughout the day they add content to be included in the debrief on a whiteboard. It shapes the structure of the debrief and creates the expectation that a debrief will happen. Empower people to innovate and remember the debrief is a conversation not a form and we have lost sight of that. Avoid the risk of turning the debrief into another checklist. In the final session of the day, Suzette leads a fascinating session on Behavioural Insights, the process of using findings of the behavioural and social sciences to help people achieve their goals and to improve the effectiveness of policy without requiring anyone to do anything! Introducing ‘nudge’, Suzette explains the subtle influences and cues we are perpetually bombarded with each day. There are things we an learn from behavioural insight specialists – changing language, colours or format, to influence behaviour. 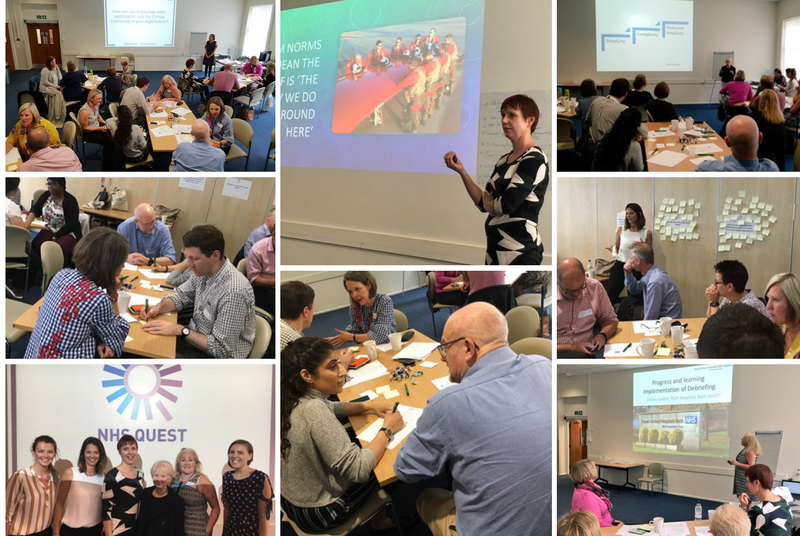 We will meet again on the 18th September, where by this point we will have started to build a key set of principles for the NHS Quest debrief. Thank you again to our fabulous speakers, Dr Suzette Woodward, Dr Jane Carthey, clinical lead, Lesley Jordan and of course our NHS Quest Senior Improvement Advisor, Zoe Egerickx and Project Manager, Sarah Snape. Tackling disruptive behaviours Swiggart, Hickson, Finlayson et al. Members can access the additional programme resources from previous events in the member’s area (you must be logged in to view this page – access only to NHS Quest members).